By Chris Williams: Jeff Horn has studying the fighting style of Terence Crawford and believes he can beat the 30-year-old Nebraska native with pressure, hard punches and awareness when the two face each other on June 9 at the MGM Grand in Las Vegas, Nevada. Horn (18-0-1, 12 KO) says he’s not going to allow Crawford (32-0, 23 Kos) to hit him with his perfectly timed uppercuts that he likes to land, as he’s going to be mindful of those shots and make sure he uses a lot of head movement to make sure that his accuracy with that punch isn’t as good as it normally is. Horn will be defending his World Boxing Organization welterweight title against the former 2-dvision world champion Crawford. Horn believes that Crawford hasn’t been hit by anyone as big and as powerful as Crawford, and he plans on hitting him as hard as he can when he gets in range. “I’ve really got to look out for the surprise uppercuts he throws. He’s very good at timing his shots. I have to feint a lot to make him uncertain of when I’m coming in and hit him very hard when I do,” Horn said to the Courier Mail. Crawford’s power and ability to hurt his opponents with counter punches is what has helped him find so much success during his 10-year pro career. Crawford hasn’t ever faced a pressure fighter with a high volume punch attack. The closest that Crawford has fought to a pressure fighter that throws a lot of shots is when he fought Yuriorkis Gamboa in 2014. That was when Crawford was fighting at lightweight, and he was hurt in that fight early on by Gamboa. After moving up to 140, Crawford fought mostly non-punchers. The one guy that Crawford did fight with power, John Molina, he was able to keep away from his power by running around the ring for the first seven rounds. When Crawford did engage in the 8h, he stopped him. ”The showman side comes from my high workrate and good boxing. I plan to upset Crawford’s style, upset his rhythm and not let him show those crafty skills he’s known for,” Horn said. Horn make sound easy in talking about his high work rate, and how he plans on upsetting Crawford’s fighting style, but what he doesn’t know yet is he’s going to have a moving target much of the time. Crawford doesn’t stand his ground when his opponent put pressure on him. I don’t know what it is about Crawford, but he’s under pressure, he’ll always get on his bike and run around the ring to keep from getting hit. When Crawford is running, he’s able to stop suddenly to throw a single shot to the body or head. He doesn’t throw combinations when he stops running, because he’s usually a little winded from his movement and he doesn’t want to leave himself open for a counter shot from his more powerful opponents. Horn wants to fight like a superhero against Crawford, and attack him and beat him down. It’s going to be had for Horn to do the same thing he did against Manny Pacquiao to Crawford, because he’s going to be moving. If Horn decides to rough Crawford up with head-butts, elbows, shoves and head-locks, he might end up being penalized by the referee Robert Byrd who will be working the fight. If the fight was taking place in Brisbane, Australia, then you would have to give Horn a good shot at using whatever fouls he wants without being penalized, but I don’t think that’s going to work in the U.S. The referee will give warnings and then take points away from Horn. It’s doubtful that the referee Byrd will go so far as disqualify Horn, because that would lead a lot of heat being put on him from the boxing world. I don’t think Byrd wants that kind of criticism from the fans and the media. ”I think when he got hit by Gamboa and wobbled…wait until you get hit by Jeff Horn,” Horn’s trainer Glenn Rushton said to theAustralian.com. ”You won’t just wobble, you will fall over. I saw something in a lot of Crawford’s fights…He hasn’t fought as a welterweight. This is going to come down to a battle of spirits,” Rushton said. Crawford is a pound-for-pound fighter, but he never fought the really talented fighters during his career. When Crawford was at lightweight, he didn’t have to deal with the likes of Vasyl Lomachenko or Mikey Garcia. I don’t think Crawford that struggled against Gamboa would beat Lomachenko. Likewise, when Crawford was fighting at 140, he never fought Regis Prograis, Jose Ramirez, Joshua Taylor, Kiryl Relikh and Sergey Lipinets. Crawford would have beaten some of those guys possibly, but I don’t think he would have beaten them all. And even if Crawford had, he’d have taken a lot of punishment. Crawford wouldn’t be able to run around the ring on Prograis, and then hit him with a single shot and watch him fall over. Prograis would take Crawford’s power fire back with his better power, and I don’t think Terence would hang for long. Crawford’s promoter Bob Arum of Top Rank was smart mot to put him in with Prograis, because that would potentially be a show stopper, a revenue-steamer stopper. If you look at the guys that Arum was matching Crawford against at light welterweight, Dierry Jean, Henry Lundy. Felix Diaz, John Molina Jr., Viktor Postol, Thomas Dulorme and Julius Indongo, it’s clear that he was being careful with him. Arum was building up a nice padded record with the guys that he was matching Crawford against. Arum is now doing the same thing with Lomachenko. The only fight on Crawford’s resume that was anywhere close to being a war was his fight against Gamboa in 2014. Crawford had problems with Gamboa’s hand speed in the first four rounds of the fight. Gamboa was faster and more powerful than Crawford. The fight turned in Crawford’s direction after Gamboa slipped on the canvas and was hit while he was off balance and knocked down. The referee Genaro Rodriguez blew the call by ruling that it was a knockdown instead of a slip. Gamboa was so angry at the referee’s decision to score as a knockdown that he just started throwing wild power shots without thinking about his defense. Gamboa lost his composure entirely, and Crawford took advantage of it by dominating the remainder of the fight. If Horn can somehow cut off the ring on Crawford, as he’s clearly going to be on the move, and force him to exchange with him, he could turn the fight into a war. As good as Crawford is, his ability to take hard shots is no better than anyone. Crawford doesn’t have a steel chin. He can be hurt, as we saw in his fight against Gamboa. If Crawford was tougher and able to take punishment, he would stand in the pocket and fight like boxing greats in the past like Evander Holyfield, Aaron Pryor and Alexis Arguello. Crawford knows his own limitations, so he’s not going to stand and trade with Horn, because the Australian hits too hard and is too dangerous. If Crawford has to absorb 20 to 30 hard shots from Horn on June 9, he’ll get knocked out quickly. Horn hits too hard, and Crawford is not someone that can be hit a lot without getting knocked out. That’s why when Crawford eventually faces Errol Spence, he’s going to get taken apart. Crawford’s game of hit and run won’t work to beat a guy like Spence, who is the Jarrett Hurd of the 147 lb. division. Spence will chase Crawford down and blast him out. That’s just the way it’s going to be, and that’s why promoter Bob Arum isn’t going to let Spence take that fight for a long, long time. Arum is a smart promoter, who knows what his fighter’s limitations are. “I’ll be applying a lot of pressure, changing angles constantly and firing power shots from both hands while changing stance between orthodox and southpaw,” Horn said. This fight sounds like it could be a mess with both fighters changing fighting stances needlessly for as long as it lasts. It’s a waste of time. Crawford is no better at southpaw than he is fighting out of the orthodox stance. Crawford is doing completely fine fighting right-handed when he changes his stance to the southpaw, and there’s no improvement, because he’s already dominating the guy. He’s usually fighting a lesser guy that he could beat with one arm tied behind his back. Boxing fans rave about how Crawford changed to the southpaw stance against Indongo and did well, but they fail to see is Crawford was doing fine fighting right-handed. Why change stances when you’re already dominating your opponent? I don’t get it. Crawford stopped Indongo in the 3rd round last August. The fans went Crawford. However, Regis Prograis fought Indongo and knocked him out in the 2nd round last March. Prograis knocked Indongo down with a jab in the 1st round. Indongo was seriously hurt from a jab by Prograis. In round 2, Prograis knocked Indongo down three times before the fight was halted. What that tells you is Crawford’s knockouts over guys with chin problems and little talent doesn’t mean that he’s an exceptional fighter. It means that he’s facing opposition that is over-matched and not as good as they need to be. Horn has a very good chance of winning this fight if he can trap Crawford and force him to brawl with him. If Horn can keep Crawford trapped long enough, I think he can knock him out and expose him. But the hardest part for Horn will be trapping him, as Crawford is definitely going to be running because that’s what he does when he’s not fighting a stiff. Crawford is not going to stand and fight, because he doesn’t do that against good opposition. He didn’t do that against Gamboa until he slipped. He didn’t do that against Molina, who really isn’t a good fighter. He just hits hard. Viktor Postol exposed Crawford’s weakness when he trapped him in the 12th round and forced him to exchange. Postol nailed Crawford with several hard shots that got his attention and forced him to take off running. That’s when Crawford stuck his tongue out at Postol, because he wasn’t going to stand and fight. Postol had made a mistake by not pressuring Crawford in an all-out way in each round. A lot of the boxing media are picking Crawford to win this fight. This fight is assumed to be a sure thing win for Crawford, but it’s his first fight at welterweight and it’s by far the biggest guy that he’s ever fought. Postol, 5’11”, is taller than the 5’9” Horn, but he’s a skinny stork with zero punching power and not much weight. Horn is a junior middleweight in size, and he’s a lot more powerful and rugged than the painfully thin Postol and Crawford. Horn is a big guy, who hurts his opponents with his heavy hands. Horn isn’t a one-punch knockout guy like some fighters, but he breaks them down with his heavy shots that have a lot of weight behind them. 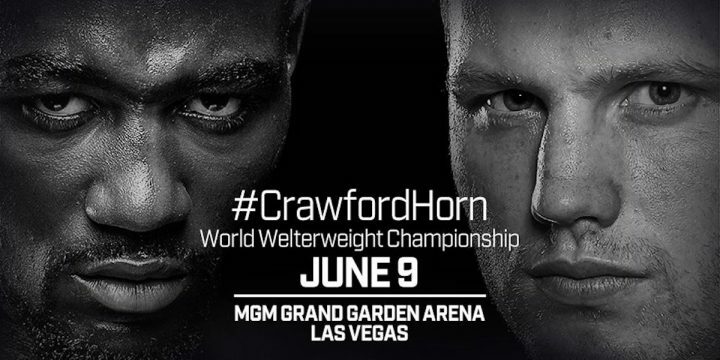 It’s going to be very difficult for Crawford to be able to take the kinds of punches that Horn is hitting him with in this fight, because if he’s able to put hands on him for long, he’ll fall apart. When you’re making a move up from 140 to 147, it changes a fighter. Only a few of them are able to maintain the power that they had when they were fighting at 140. Look at Danny Garcia as an example of that. Garcia was a huge power at light welterweight. But since moving up to the 147 lb. weight class, his power has disappeared.